High performance entertainment and gaming PCs are slowly but steadily increasing their presence into modern living rooms. This is largely attributed to the development of compact and powerful components that made small form factor (SFF) gaming PCs an affordable option. Although it is difficult to build a powerful gaming system as small as a gaming console, the development of aesthetically alluring SFF cases, in combination with the versatility and other advantages that PCs have, is turning them into a very serious competitor with gaming consoles. As compact and unique home entertainment and gaming systems are gaining ground, so do the SFX power supply units. PC components are not only becoming more powerful but also more efficient, lowering the power requirements of typical gaming systems. At the same time, power supply units (PSUs) are also becoming more efficient, smaller, and affordable. Thus, advanced SFX PSUs are increasing their market share, with increasingly more manufacturers adopting them into their products lineup. In today's review we are taking a look at the latest SFX PSU from Be Quiet!, the SFX-L Power 500W. The German manufacturer specializes on PC cases, cooling and PSUs. As the company name suggests, their products are primarily designed with acoustics performance in mind. 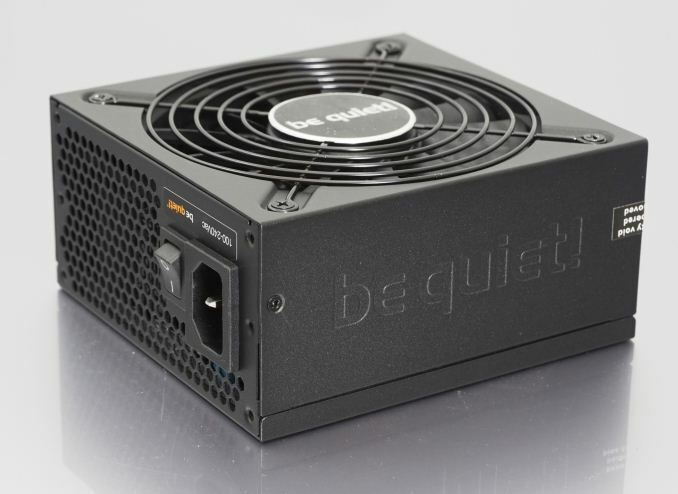 According to the manufacturer, they designed their new SFX-L Power units to power modern living room entertainment and gaming systems just as well as an equivalent ATX PSU would, including whisper-quiet operation. The Be Quiet! 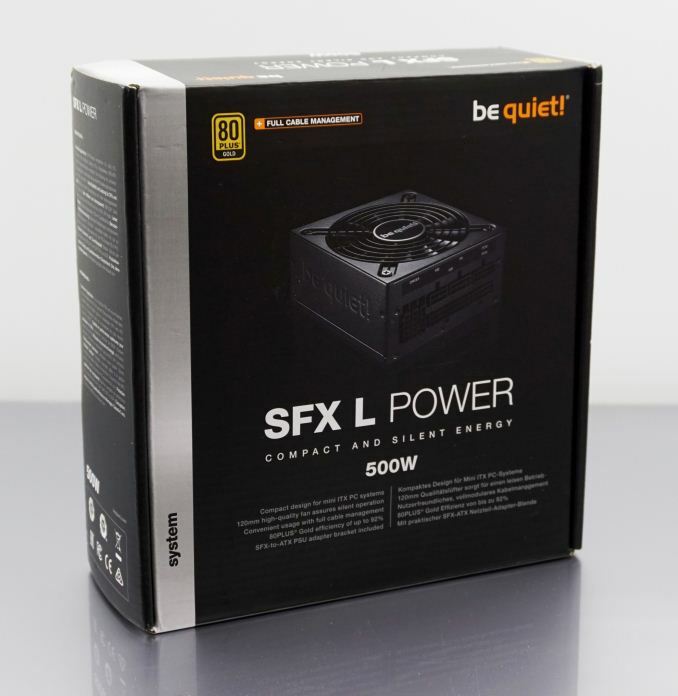 SFX-L Power also is reasonably priced for an 80Plus Gold certified, fully modular SFX PSU. We will closely examine its quality and overall performance in the following pages of this review. 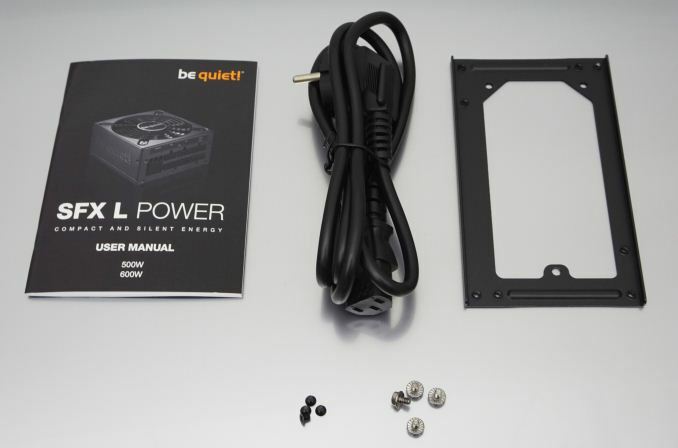 As always, Be Quiet!’s dark packaging is aesthetically minimalistic, with just a simple picture of the PSU breaking coldness of the all-black theme. However, its thick walls and polystyrene foam slabs offer ample shipping protection to the small unit. The bundle of the SFX-L Power 500W unit is very basic, limited to just the necessary AC power cable, four silver mounting screws, and a typical user’s manual. There are no cable ties, cable straps, or other accessories. However, Be Quiet! included an SFX to ATX adapter plate, allowing the SFX-L Power 500W to be installed into ATX cases. It is interesting to note that the adapter has holes to support the PSU with its fan facing either upwards or downwards, allowing it to be installed in either orientation inside an ATX case. With the SFX-L Power 500W being an all-modular design, every cable can be detached, including the 24-pin ATX cable. All of the cables are ribbon-like, “flat” type, which is the reasonable choice considering that the PSU may be installed in very confined spaces where every millimeter counts. Note that these cables are much shorter than those of a regular ATX unit, with the ATX cable being just 30 cm (11.8") long and the PCIe cables only 40 cm (15.75") long, which could make the installation of the SFX-L Power 500W inside a large ATX case highly problematic. Every cable is made of black wires and black connectors. It is also interesting to note that this particular model has four 6+2 pin PCIe connectors, which we rarely see on PSUs with an output below 600 Watts. Oh, nice. Someone thought to use a FDB fan in the PSU. Not all FDBs are the same (Not sure which one is actually used in the Globe Fan in this PSU) and not all are actually manufactured better than sleeve bearings.